As a little girl, I was totally in love with chocolate. Aren’t all little girls? Well, with me it was serious. I would tiptoe slyly into our living room, where the cupboard containing the chocolate sat. This was usually boxes of chocolates bought by family or my parents’ friends when they came over for dinner or Sunday lunch. I never touched the unopened boxes, but the opened ones mysteriously grew emptier and emptier with each passing day. I was only caught sometimes, but my family was in no doubt that it was me making the chocolates disappear. From the tins of Roses to my favourites, After Eights, I would sneakily return to that lovely cupboard often. I’d wonder at how the chocolate makers could create such a soft, gooey caramel and cover it in chocolate, or how they got that tangy raspberry flavour, or such a thin layer of minty fondant. I would bite a chocolate in half and dissect it, trying to understand how it was made. I dreamed of owning a chocolate shop. As I grew older, I began experimenting in the kitchen, making my own chocolates. After several years of office work, I decided to quit staring at computer screens and pursue my passion, spending my days making chocolates and putting smiles on people’s faces. 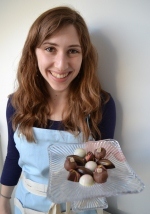 I spent some time working in three of the best London chocolateries, and studied with Ecole Chocolat and Valrhona. My wonderful dream came to fruition in 2012 as I launched Kokopelli’s Chocolate, a small artisanal chocolate company based in London. Kokopelli’s uses the food of the gods, magical chocolate, to explore the myriad flavours and cultures of the world, always experimenting with new ideas and techniques. I only use fresh, natural ingredients in my chocolates, as well as the finest couverture. Everything is made by hand. I am always on the lookout for new ideas, so please get in touch with something you’d like to see at Kokopelli’s Chocolate!